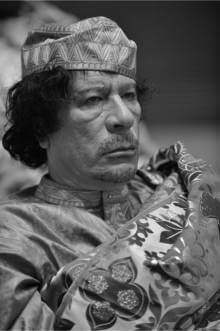 Quotes about Muammar al-Gaddafi: The Italian politician Mario Borghezio said this of him: "Gaddafi was a great leader, a true revolutionary who should not be confused with the new Libyan leadership swept into power by NATO's bayonets and by oil multinationals"
Hugo Chavez ex-president of Venezuela called him the: "Liberator of Libya, He will be remembered as a great fighter, a revolutionary and martyr"
Carlos the Jackal gushed with glowing respect by stating: "This man did more than all the revolutionaries"
"Once a ruler becomes religious, it becomes impossible for you to debate with him. Once someone rules in the name of religion, your lives become hell"
"In the Middle East, the opposition is quite different than the opposition in advanced countries. In our countries, the opposition takes the form of explosions, assassinations, killings"
"Libya lived for 5000 years without oil and it is ready to live another 5000 years without it"
"Reagan is mad. If he were here, I would tell him the truth about us. He hears about us only through hostile sources"
"Man's freedom is lacking if somebody else controls what he needs, for need may result in man's enslavement of man"
"I won't be a party to a conspiracy to mobilize the Arabs against the Persians. 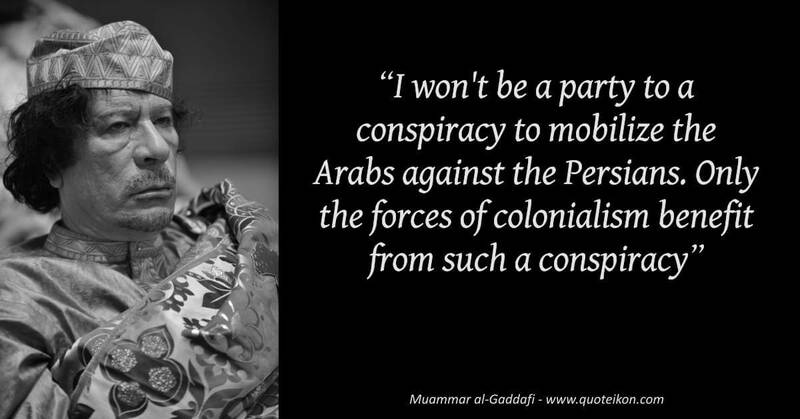 Only the forces of colonialism benefit from such a conspiracy"
"Libya has had to put up with too much from the Arabs for whom it has poured forth both blood and money"
"How can the Security Council issue resolutions based on reports from news agencies?" "I am a Bedouin warrior who brought glory to Libya and will die a martyr"
"If Abu Nidal is a terrorist, then so is George Washington"